So I made it home to Virginia in one piece, albeit slightly jet-lagged and extremely spacey. It’s been great to be home to see everyone. I have a bit of a last minute and unexpected bake – my mom decided to throw a cookout (a barbecue, as the Brits call it) and have the whole family over so I could see everyone in one visit. 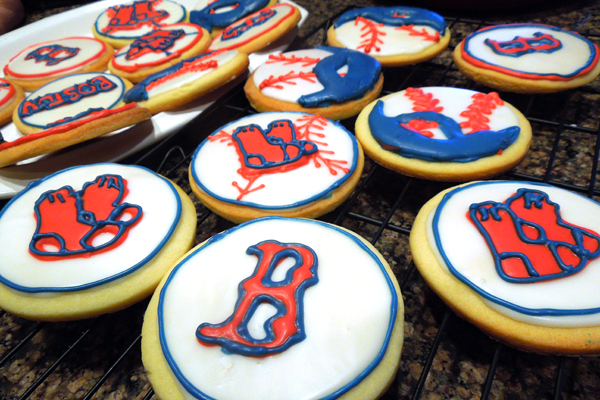 The Boston Red Sox have just won the world series, so my mom wanted to have a Boston-themed get together. 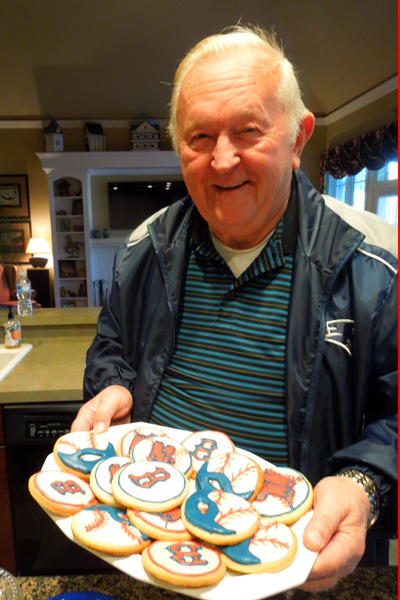 My grandfather is the BIGGEST Red Sox fan you will ever meet. He’s loved them since he was a kid and has stuck by them through all the painful years of never quite making it to the World Series. He even has an entire room in his house dedicated to photos and memorabilia, a lot of it actually signed by different members of the team from over the years! 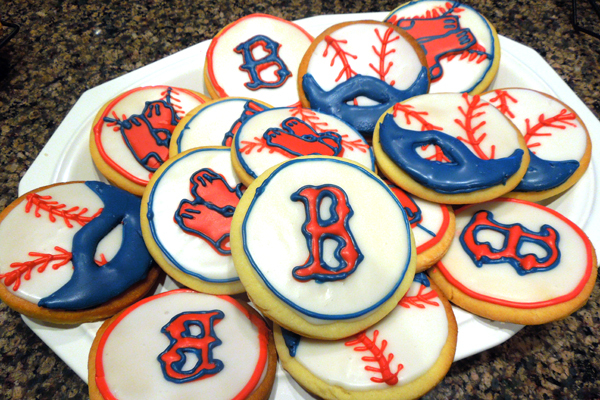 As my contribution towards our dual celebration (the Red Sox and my arrival), I did another batch of quick sugar cookies, but this time I decided to use royal icing to pipe the Boston emblem, some red socks, and (more topically) a few bearded baseballs – as a token of luck, the entire team had grown beards. Grandpa loved these cookies, and wouldn’t let anyone eat them at first! His only regret was us not telling him it was going to be a Boston-themed party so he could have worn the appropriate attire. It’s been great being home, and I’m looking forward to a few days of relaxing and catching up with everyone. Hopefully this trip will really help me recharge and get ready to jump straight back in once I get back to London.